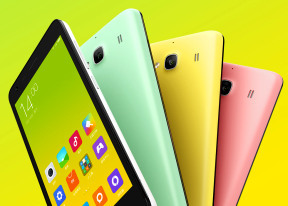 The Xiaomi Redmi 2 comes with a custom Gallery app with slightly updated flat looks compared to MIUI v5. It defaults to your camera roll with two shortcuts at the top that will take you to album view of your local images and album view of your cloud pictures. You can't change this view, nor can you customize the default folders. The available features when viewing a single image are pretty standard - share it, delete it, enter edit mode or just get more info. The MIUI music player is a custom app with a well-laid out, easy to navigate interface. It features a two-page layout - the first one is cloud music, similar to Google Music service provided by Xiaomi. It has similar subscription plans. The second page has your own local and cloud music. The player has cool effects, transitions and transparent elements, especially on the expandable Now Playing section. Xiaomi Redmi 2 does features a separate video app, but you can also use Explorer to find some videos the default app doesn't recognize (but are still playable). The video player interface is very basic but there is rich video codec support. It managed to play everything we threw at it (including MKV and WMV files). The AC3 audio codec is supported too. When connected to an active external amplifier the Xiaomi Redmi 2 performance is pretty good and markedly better than any other Xiaomi phone we've tested in the past. The smartphone posted excellent scores all over the field and its volume levels were well above average. 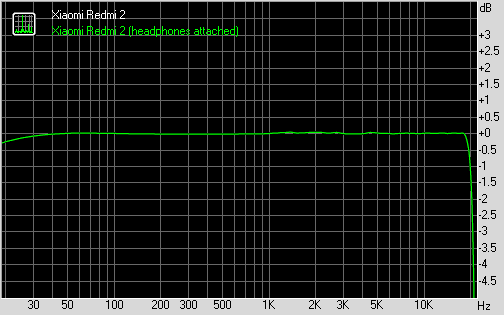 Plugging in a pair of headphones causes a very minor increase in stereo crosstalk leaving the other readings unchanged. That's a pretty solid performance no matter how you look at it.